Growing up, deviled eggs were a staple at any potluck. Whether it was a neighborhood grill out or a family get together, holidays like Easter or birthday parties… someone would bring those tasty little things! I remember my neighbor Mary having the best deviled egg recipe! I always looked forward to eating them. Deviled eggs are so rich and delicious. They are a classic side dish. It dawned on me that, as much as I love deviled eggs, I had never taken a turn at trying to make them, So, I got the best deviled egg recipe (straight from my grandmother’s recipe box), the necessary ingredients, and I thought I would give it a go. My grandmother’s recipe made for easy deviled eggs, with only about 6 steps to completion. After giving it a go, I will definitely be making them again. If you have extra boiled eggs, make sure you use them to make this egg salad sandwich. I am sharing this amazing recipe here, today! So, hopefully you can give it a go as well. My recipe is for a classic deviled egg. But, as with many classic recipes, people are starting to get creative! 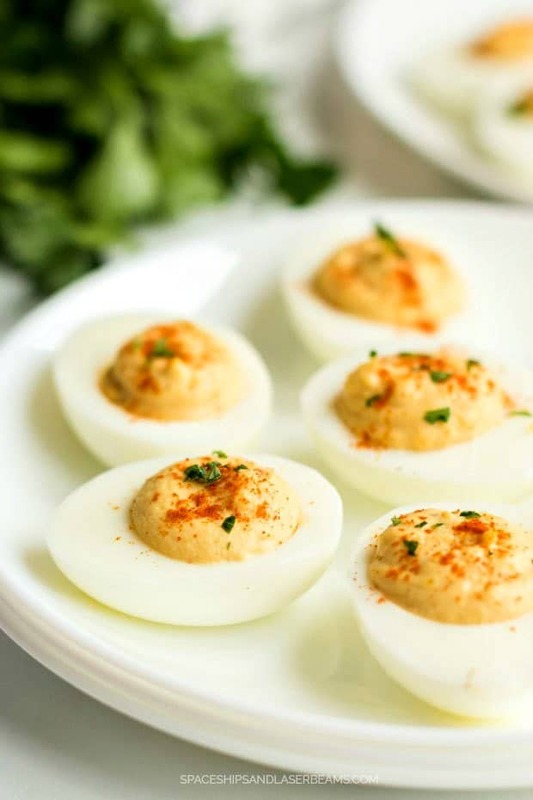 There are tons of ways you can spice up this recipe and give your deviled eggs a twist. If you’re looking for a recipe kids will love, check out these colorful devilled eggs. Try adding bacon or jalapeños. You can also add some ranch to the egg mix. Even something as simple as fresh dill as a garnish will add a new spin on this classic side. Deviled eggs are eggs that have been hard boiled. After boiling, they are peeled, and the cooked yolks are carefully removed by cutting the eggs in half. Next, the yolks are combined with various ingredients. Typically, they are mixed with mayo and mustard. But this is where creativity can come into play as well. Try mixing in other spices, avocado, or fresh herbs for extra flavor! After making this mix, the filling is then put back into the eggs whites from before. 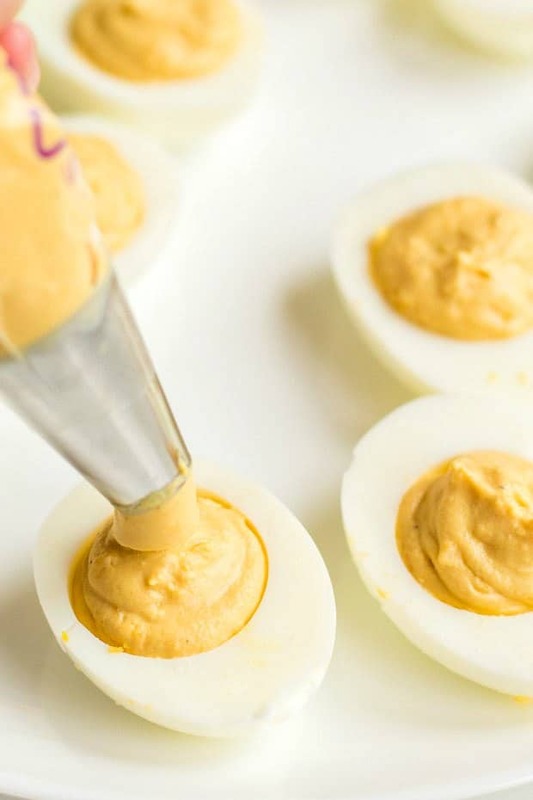 Making the perfect hard boiled eggs can sometimes be the trickiest part of making deviled eggs! Here is how I go about boiling my eggs so that they are perfect every time. I put the eggs in a pot of water and immediately cover the pot with a lid. I bring the water to a boil with the eggs in it. Once the water has just started to boil, I leave the eggs on for about 1-2 minutes and then I remove them from the heat (leaving the cover on the pot). I let them sit for about 10 minutes. Then, I remove them from the water and put them into an ice bath (a bowl with cold water and ice cubes). After letting them chill, I peel them immediately. First, you will want to boil the eggs. Following the instructions above. Next, cool the eggs in an ice bath and peel them immediately (being careful not to break the eggs!). Then, carefully cut the eggs in half. You will want to cut them in half the long way. Using a small spoon, take out the yolks and put them in a large mixing bowl. Set aside the egg whites for later use. I like to use an egg platter to hold the egg whites. It makes it much easier to manage. The hard boiled eggs can be slippery little guys! Mash the yolks along with your other ingredients until well mixed. After you’ve created the mix, the next is to fill the egg whites. I find it easiest to do this using a pastry bag. You could also put into a sandwich bag and cut the corner. After you have filled the eggs, they are typically garnished with a dash of paprika and parsley. I like this for a classic recipe. But this is where you can again get creative! Make sure to serve the deviled eggs nice and cold! If they will be sitting out at a potluck it might be a good idea to set your platter over ice to keep them nice and chilled. 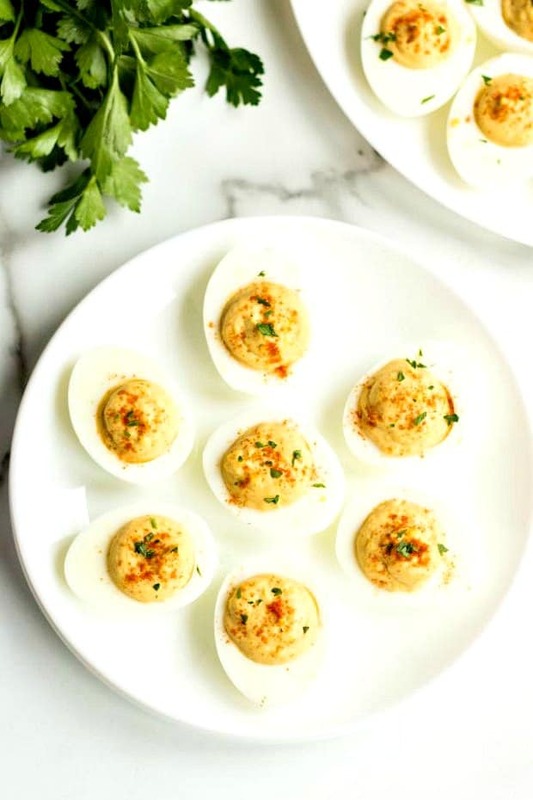 With deviled eggs being classic and fairly simple, the sky’s the limit as to what you can add for toppings to spice them up. Recently, I’ve seen two popular additions: avocado and bacon. Is there any dish that isn’t made better by the addition of avocado? Avocado deviled eggs? It doesn’t get much better than that! Likewise, bacon adds a nice crunch and flavor to the deviled eggs. You can keep your toppings simple by adding more basic ingredients such as horseradish, dill, pesto, or relish. Or if you’re like me, you can keep it classic with just a touch of paprika and a parsley garnish. You can also make more than one option and serve them multiple ways on one platter. In my opinion, you can’t go wrong with deviled eggs. They are a classic recipe and a family favorite. They are easy and delicious and they are incredibly versatile! These deviled eggs are so rich and delicious -- the perfect classic side dish. Cut the hard boiled eggs in half, lengthwise. Use a small spoon to scoop out the yolk into a mixing bowl. Set aside the whites for later use. Mash the yolks along with the mayo, dijon mustard plus salt and pepper. Once it's well mixed, fill a pastry bag with the mixture to pipe into the egg whites. After you have filled the eggs, you can garnish with a dash of paprika and parsley. 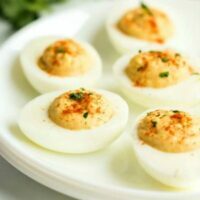 This is a great classic recipe for deviled eggs. Always a hit in our home.